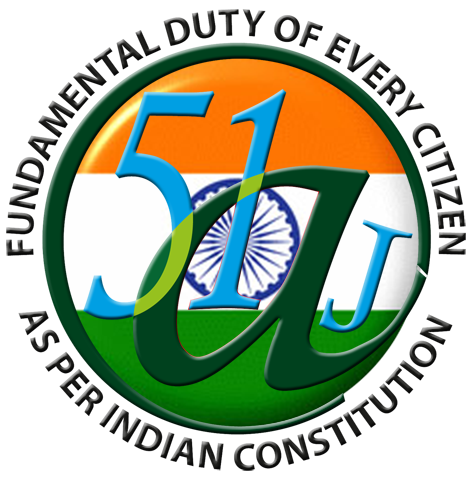 The Fundamental Duties were inserted into the Constitution of India by the 42th Constitutional Amendment Act, 1976 on the recommendations of the Swaran Singh Committee. Ten Fundamental Duties were included in Article 51-A under Part IV-A through this amendment. The 11th Fundamental Duty [51-1(K) was added by the 86the Constitutional Amendment Act, 2002. The idea behind the incorporation of the Fundamental Duties was to emphasize the obligations of the citizens in exchange of the comprehensive Fundamental Rights enjoyed by them. Basically, the Fundamental Duties were incorporated with the purpose of making the citizens patriotic, help them to follow a code of conduct that would strengthen the nation, protect its sovereignty and integrity, help the State in performing its diverse duties and promote ideals of harmony, unity, common brotherhood and religious tolerance. These ideals are the very cornerstone of the Constitution. The Fundamental Duties have highlighted the importance of citizens in the functioning of the State and urges upon them to do their best to discharge their duties. Japan is the only democratic country in the world which provides for a set of Fundamental Duties in its Constitution. The Indian Constitution has borrowed the concept of Fundamental Duties from the Constitution of Socialist countries (erstwhile USSR). The duties enumerated in Article 51-A are statutory duties and are enforceable by law. Violation of the duties can be met with punishment. But the Constitution does not impose penalty for the violation of the duties. It is left to the Legislatures to prescribe penalty for the violation of specific duties. Some of these duties are already being enforced though ordinary law, e.g. there are laws making any activity disrupting the sovereignty and territorial integrity of India illegal and penal. The Constitution imposes upon the citizens definite duties towards the society and towards the State. The eleven duties are as under. (k) who is parent or guardian to provide opportunities for education to his child, or as the case may be, ward between the age of six and fourteen years. The addition of Fundamental Duties along with exceptions to the Fundamental Rights limits the operation and free enjoyment of Fundamental Rights. The critics have called these Duties as moral precepts, pious platitudes, vague and repetitive. They questioned the very wisdom of incorporating them in the Constitution. According to them, it is very difficult to comprehend fully the meaning of some of the Duties, as for example “cherish and follow the noble ideas of the freedom struggle, scientific temper, humanism and excellence”. Some of the duties also do not appear to be capable of legal enforcement. These can at best be regarded as ‘directory’. As regards enforceability of these duties, it has been held that these duties being of individual citizens cannot be enforced through mandamus, as they cast no public duties. However, there is no doubt that these duties are a constant reminder to us of the national goals as well as the basic norms of political order. They may inspire us to inculcate in ourselves a sense of social responsibility. The Supreme Court has held that Article 51 A can be used to interpret ambiguous statutes. Fundamental Duties have been particularly invoked in litigation concerning the environment. They are much of an educational and psychological value for the citizens. Article 51A is confined to ‘citizens’ unlike some of the articles relating to Fundamental Rights which extend to ‘all persons’. Nice article. We, Indians should develop scientific temperament and eradicate superstitions from all spheres of life.